The Highways Department of Hampshire County Council has ordered Chris Huhne’s office to move some of their campaign posters following a complaint from a member of the public. Up to ten of the 3 ft Square fluorescent orange billboards proclaiming ‘Liberal Democrats Winning Here’ had been erected outside Bursledon Market on the busy Bursledon roundabout where about 500 feet away and a week earlier, rival Conservative candidate Maria Hutchings had unveiled a prominent 15 x 20 ft election hoarding declaring herself as ‘The Local Choice’. 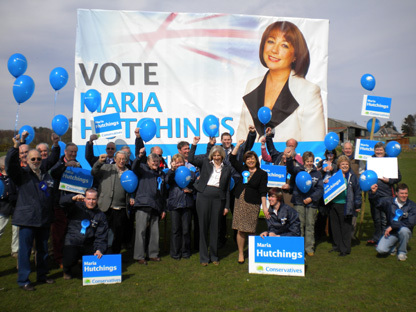 Maria Hutchings campaign launch at site of mega poster. “I have visited the site in person and agree that the glare from the (liberal) posters in sunlight was a potential distraction to drivers. I suggested that a number of the signs should be adjusted and repositioned. I did not ask for any signs to be removed. “We have had a large number of our signs systematically uprooted all over the constituency. 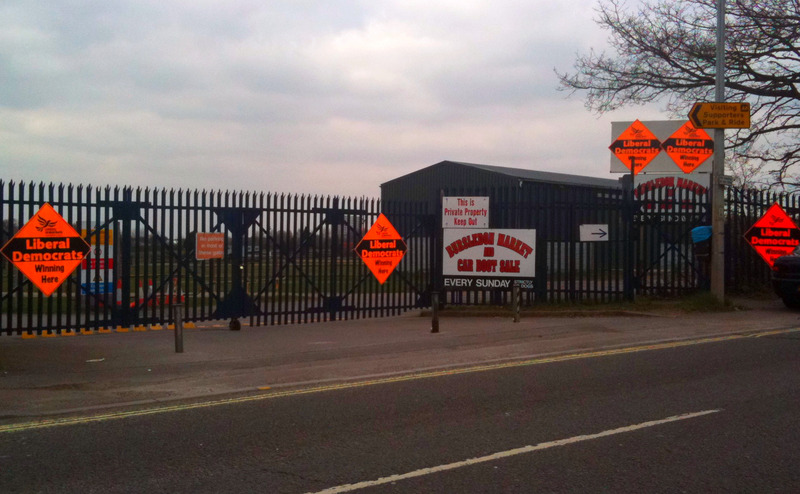 “It is hugely disappointing that signs are being vandalised and/or removed. This is a free and democratic country and residents should feel free to display posters in their support of a party. Anyone spotted any labour posters yet? vote ukip keep Britain free ! Oh yes Molly Vote Ukip and let Chris Huhne ,a Europhile who has written two books saying we should ditch our pound and take on the Euro ,win the Eastleigh seat again. That’s interesting to hear you say that David, as I know Eastleigh Ukippers claim that it was Tory defections to Ukip which cost Conor Burns the seat last time out. As I said,Vote UKip and elect Chris Huhne. It’s interesting that you acknowledge the threat Ukip pose to your candidate in this marginal seat. I’m sure you must be aware that if Maria makes a committment to support EU withdrawal then Ukip would stand down their candidate to give her a clear run. Whilst I still remember and feel the pain of the eighties under Tory rule, I cannot help but think that Maria would be the best person to represent the people of Eastleigh locally and in Westminster. The thought of a full Tory government at this time is perhaps not the best for normal, honest, working class people that make up the main in Eastleigh, the thought of more BARMY LIB DEM rule locally and as our voice in Westminster is untenable. Mr House with his BARMY policies and stranglehold on democracy has to stop and Mr Huhne with his ‘Wishy Washy’ stand on real local issues is as BARMY as his partners in crime at local level. Where was his voice on the Allotments, Sid the Tree, 34 million on a hotel, Eastleigh Bypass. In fact anything that goes against what his BARMY friends are doing locally and the man losses his voice..!! It’s time to have someone in a position to stand up for local people and question the BARMY Lib Dem’s at local level. Vote for Maria if you really care about the future of OUR town and OUR community or vote for more of the same for the next 5 years.? Whoahhh! You read it here first at EastleighNews.co.uk! Under NO circumstances will UKIP Eastleigh Parliamentary Candidate Ray “Two Tories” Finch be standing down for Maria Hutchings (whatever she says at this late stage to help get herself elected). She had her chance in 2008. I asked her if she personally believed Britain should leave the EU. She said it was “not quite as simple as staying in or leaving”. That was enough for me. From her non-answer I realized NOTHING had changed. The same rotten pro-EU Tory stance was exactly the same as 2005. Well before the election in 2005 I asked Conor Burns the same question, whether he believed Britain should leave the EU. Depressingly and rather mechanically, as if perhaps he did not really believe what he was saying but felt obliged to say it anyway because it was party policy, he said Britain should be “at the heart of Europe but not run by it”. Bad answer by Conor! From that moment on his electoral fate was sealed. Once UKIP decided to stand on the basis of his answer, defeat was inevitable. To fail by 568 votes must have been truly devastating. I should have thought that 3 defeats would have been enough to force the TRUE CONSERVATIVE REVOLT. But no! Political cowardice and opportunism forced a conspiracy of silence within Tory ranks. They thought that by keeping quiet on Europe they would appear to the outside world as if they were united and this would be enough for them to win. How little they realized! Had they come to me I could have told them what lay in store. Come to think of it, I did … Through the pages of the newspapers. But then who listens to me??? Maria Hutchings (for all I know) could be a rabid Europhile. On the other hand she could be very anti-EU. We may never know. By her deliberate avoidance of my question she has ensured that UKIP stands against her to split her vote. How utterly pointless! And yet there is a point for those who would see it. The point is really about the most important question in democratic theory imaginable: Who should govern Britain, Europeans or the British? The Tory ruling elite reckon it should be European politicians. UKIP reckons it should be Britons. Ladies and gentlemen…we shall leave it up to the electorate to decide. I believe once again the electoral scales are finely balanced on a knife edge in Eastleigh. Will it be Huhne or Hutchngs nestling into the plush green leather benches of Westminster? Once again all may depend on UKIP Eastleigh but this time, with things as tight as they are, we could be looking at just a handful of votes in UKIP’s hands. That’s how close it could be. But it is enough, under the law of the land, to hand victory to one of the candidates and wretched defeat to the other. The Tories spent an estimated £35,000 plus and an estimated 10,000 man hours trying to win Eastleigh in 2005. What a waste considering UKIP spent only about £2,000 and 600 man hours! That’s all it needs to scupper Tory plans in marginal seats. And that’s why UKIP smells blood. That’s why UKIP is focussing on Tory marginal seats right across Britain! And that’s why the Conservatives must revolt or perish. Some people say UKIP should stand down to let Maria Hutchings have a clear run. I say why? Surely they must know that UKIP has now woken up to its pressure group dimension. There is no going back for UKIP! All political parties have a pressure group dimension. For years UKIP has been largely unaware of its devastating power in Tory marginal seats. But not any more! UKIP under the leadership of former Tory peer Lord Pearson is now using its pressure group dimension to devastating effect. On the wider scale, this whole election could be marginal. UKIP could tip the scales away from Tory victory to a hung Parliament. This would be tantamount to a 4th Tory defeat and would trigger the inevitable (and long overdue) TRUE CONSERVATIVE REVOLT. Those of you who say you are “Tories” and who have doggedly stood by the Tory party over the last five years, have let yourselves and your country down. I realize your motives are well intentioned but you are seriously misinformed. Had you acted firmly in 2005, by voting UKIP, then the TRUE CONSERVATIVE REVOLT would have happened in 2006 and the Tory party would now be riding into this election on the back of a firm commitment to an in-out referendum. As such UKIP would have been totally nullified and a Tory landslide would have been inevitable. But perhaps it had to be this way. No party can survive 4 defeats in a row without a total rebuild. Perhaps it needed this to galvanize TRUE CONSERVATIVES to get off their backsides and see exactly what the party which cloaks itself in patriotic colours really intends for the country. The answer is MORE TREASON. Those of you who still doubt the Treason of the Tory party should ask yourselves this question: Is it right for Tory leaders to support the governance of Britain by a foreign power (an institution which by definition assumes a legal supremacy over our own legislature)? The answer is NO! It is NOT right for Tory leaders to do this! By definition that is TREASON. Those of you who prefer the easy way out and who prefer expedient “labels” like “Conservative” will hate me for these words. But deep in your hearts you KNOW I am right because I am a TRUE CONSERVATIVE! On a lighter note, some people wonder why Ray Finch has the nickname “Two Tories”. Rumour has it he eats two Tories for breakfast. Personally I don’t believe it. Nobody could do that…could they?? ?